Can an app have a significant impact on a child’s reading? Many learning apps have been developed, but few have proven learning benefits. The gap between the technology-rich world that children live in and the paper-book world of school needs to be filled with effective literacy and numeracy tools specifically designed for digital natives. Sounds English Phonics has been developed to fill this gap. It is an early literacy app that helps readers accelerate word recognition in order to progress them more quickly through the early stages of reading. Built for a word recognition reading age of about 6-9 years, it teaches 92 commonly occurring written sounds and contains over 1800 practice words. The app also personalizes learning for each user, uses formative assessment, synthetic phonics and speech formation tuition. Sounds English Phonics can be used alongside, and is complementary to, existing literacy programmes. A study was conducted by Zaprendo – in St John’s Green School, Essex, United Kingdom with a sample size of 61 children in Grade 3, aged between 8-9 years old for a 3-day period commencing the 11th of April. The University of Surrey analysed and reviewed the data. One group used Sounds English Phonics in the classroom during the school day and were scheduled to spend 15 minutes a day using the app over 20 school days (a 30-day period), within their scheduled standard literacy class. A control group did not use Sounds English but continued with their regular literacy activities. Both groups were tested at the beginning of the study and at the end of the study using the BURT reading age test. Students in the Sounds English group were also tested for retention one month after the end of the study. ‘I wanted to write to you on this Friday night here in NC. I’m sitting with my 6-year old nephew and his mom. His school was concerned that Griffin’s reading was not at the level they expected. My sister had purchased Sounds English Phonics, that’s how I was first introduced. Watching Griffin tonight I was really fascinated. He was truly using a phonetic approach with the words. In the States we do a very poor job of helping kids actually use phonics. I need to say again, more than ever that I am blown away your approach. Sounds English Phonics was 2.8 times more effective than the standard programme within the study period of only 30 days. 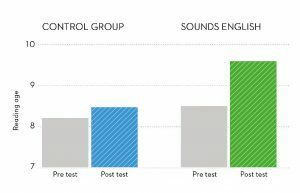 Not only did the majority of students using Sounds English Phonics gain more than a year in reading age, the average gain amongst this test group was 11 months within a 20 school day period. Every student in the test group improved their reading age. Additionally, 42% of children in the test group learnt all 92 written sounds within 15 school days and 100% learnt all 92 in 20 school days. By comparison, in the control group, only 3% of children improved by more than one year in reading age, the mean gain was just four months and 17% of children failed to register improvement. Sounds English Phonics improved the test children’s reading age by a significantly higher number of months than the control group. This improvement for the Sounds English Phonics class was recorded for all boys and girls, including Special Educational Needs (SEN), Phonological Processing Disorder (PP) and English as an Additional Language (EAL) students. ‘We had great success using Sounds English Phonics. It was very easy to incorporate 15 minutes a day of self directed use into our daily routine. All children benefited from using the app. All children in both classes were tested for their reading age at the beginning of the study and at the end of the study. Prior to the start of the study and at the beginning of the school year, the year group was split into two classes by the school. There were no significant pre-existing differences in reading age between the two groups at the beginning of the study. However, at the end of the study, children who had used Sounds English Phonics had a significantly higher Reading Age than children in the control group. Sounds English Phonics delivers lasting results. In a follow-up, a month later, children who had used the Sounds English app were re-tested, and the gain in their reading age had been sustained. Sounds English produced a ‘very significant’ improvement compared to a standard phonics approach*. Sounds English Phonics is a very high impact learning tool which improves early reading acquisition for readers with a word recognition reading age of 6 to 9 years. Teachers involved with the test group stated it was easy to engage the students with Sounds English Phonics, noting they were soon able to self-manage their progress with the app. Sounds English Phonics can be used alongside, and is complementary to, existing literacy programmes.